Click on the photo and see all the photos of Apartment Birkenwald.9. WiFi available in all areas, Golf course (within 3 km), Billiards, Hiking, Cycling, Horse riding, Sauna, Solarium, Indoor pool (seasonal), Garden, Sun terrace, Shared lounge/TV area, Children's playground, Laundry, Lift, Designated smoking area. 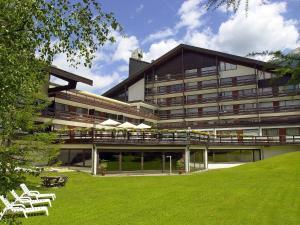 Apartment Birkenwald.9 is set in Seefeld in Tirol and offers a garden. Guests staying at this apartment have access to a fully equipped kitchen and a terrace. The apartment has a satellite TV, 1 bedroom and a living room. Offering private parking, this 3-star apartment also features free WiFi. The apartment offers a children's playground. If you would like to discover the area, skiing is possible in the surroundings. Casino Seefeld is 600 metres from Birkenwald 6, while Rosshütte is 800 metres away. The nearest airport is Innsbruck Airport, 23 km from the property. Please note that the full amount of the reservation is due before arrival. Interhome will send a confirmation with detailed payment information. After full payment is taken, the property's details, including the address and where to collect keys, will be emailed to you. Please inform Apartment Birkenwald.9 in advance of your expected arrival time. You can use the Special Requests box when booking, or contact the property directly with the contact details provided in your confirmation. A security deposit of EUR 200 is required upon arrival for incidentals. This deposit is fully refundable upon check-out and subject to a damage inspection of the accommodation. This property will not accommodate hen, stag or similar parties.